I was playing fetch with Bosley and he snapped his dew claw in half somehow! It's still attached... just kind of hanging by the quick at a 90 degree angle... He didn't give any indication he was hurt, and still wanted me to throw the ball. I just happened to look down and see some blood in the dirt where he was standing. My question is, what should I do about it? He is licking it clean now that I put the ball away. He's not acting like he's in any pain and of course the vet is closed by now. I could get him there in the morning though. I have some antiseptic stuff I can put on it. Has this ever happened to anyone? vet check would be good. until then I would wash it with a light antiseptic and try and keep it clean. my boys broken his and it healed fine. vet will likely want to clip the extra off so it can snag and get repeatedly torn. Bronx has doen that 2 seperate times. About a month ago I was in Oklahoma City for work (Ive been here for 2 months now) and leave Bronx with my 4 roomates. They were playing fetch with him and noticed he had ripped hisa off as well. I took him to the vet the first time but there isnt really anything they can do that you cant do. I would recommend you get some cleaning supplies ( bandages, tape, antibacterial ointment and peroxide) and clean it every morning and let it air out every night. Do this for a week or two and he should be back to action . Yikes! Cherry had hers removed by her breeder before I rescued her so I'm not experienced with dew claws....I just wanted to say I hope your boy heals quickly and the vet visit goes ok!! Cherry wrote: Yikes! Cherry had hers removed by her breeder before I rescued her so I'm not experienced with dew claws....I just wanted to say I hope your boy heals quickly and the vet visit goes ok!! x2 Maili doesn't have her dew claws either. I hope your boy isn't in too much pain and gets better soon. I never really knew dogs could tear their dew claws like that. 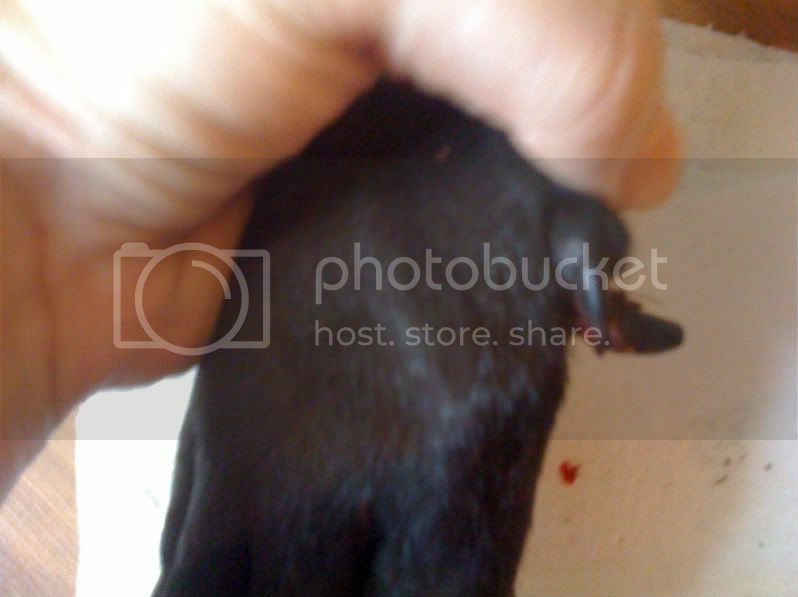 PaigeJ wrote: I never really knew dogs could tear their dew claws like that. Neither did I, til now. He's doing better today. He never acted like it even bothered him, except for wanting to lick it right after it happened. I put some ointment on it, tried to tape it (but he would have none of that) and it looks a lot better today. It's trying to heal and fuse but doing so at an odd angle. I suppose it won't hurt to have his dew claw grow a little off angle? kaliya5 wrote: I suppose it won't hurt to have his dew claw grow a little off angle? No..I don't think it would matter if the dew claw was off by a few degrees. What purpose do dew claws serve anyway? Is it more useful in wolves? The vet can do a mild sedative and pull the nail off. It will eventually grow back. I've found that dew claw tears happen most often when I've been a little lax in clipping them. The concern with an off angle dewclaw is it may be more prone to tearing repeatedly. I heard that they use them when runing down hills?? Adrianne wrote: The concern with an off angle dewclaw is it may be more prone to tearing repeatedly. I've seen both Fran and Hank use them when lure coursing and turning while running. rofl my old boy would sometimes rip his nails when he fell up the stairs. yah i said up. Sometimes he was klutzy. Just keep it clean, and trim off anything he can't feel (extra nail that's hanging off). It should heal up on it's own. Otherwise try to keep them short. Some dogs will chew them down on their own when they get too long, like cats do. My dogs use their dew claws to grip bones. My dog uses hers to grip and to climb. She uses them every day and I can definitely tell a difference in ability between my dog that has them and my dog that has his removed. I'd never have puppies toes removed unless they actually became a problem(or had no bone). It's a valuable tool to them. BrokenAquarian wrote: My dog uses hers to grip and to climb. She uses them every day and I can definitely tell a difference in ability between my dog that has them and my dog that has his removed. I'd never have puppies toes removed unless they actually became a problem(or had no bone). It's a valuable tool to them.